Marguerite of Angoulême was born 14 May 1553 in Château de Saint-Germain-en-Laye, Saint-Germain-en-Laye, Yvelines, Île-de-France, France to Henri II of Angoulême (1519-1559) and Caterina de' Medici (1519-1589) and died 27 May 1615 in Hostel de la Reyne Margueritte, Paris, France of unspecified causes. 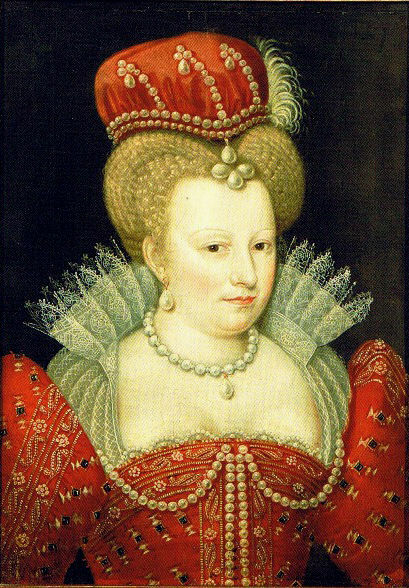 She married Henri IV de Bourbon (1553-1610) 18 August 1572 JL in Notre-Dame de Paris, Paris, France. Notable ancestors include Henry II of England (1133-1189), William I of England (1027-1087), Charlemagne (747-814), Hugh Capet (c940-996), Alfred the Great (849-899). Ancestors are from France, Italy, Spain, the United Kingdom, Germany, Portugal, Belgium, Russia, Ukraine, Hungary, the Czech Republic, Belarus, the Netherlands, England, Switzerland, Turkey, the Byzantine Empire, Sweden. Their marriage was annulled in 1599 by decision of the Pope.